There’s never been a better time to plant! We were all a bit tired yesterday afternoon. Hayden’s was cranky pants all day, but then Peter the Greek turned up and cheered us all up. If you were going to get a blood transfusion you’d choose this guys blood. Everything’s beautiful, according to Peter. He speaks like Con the fruitier, so you start to smile even before he says it. “Your going to love my plants today, everybody loves my plants, everybody wants them”. Peter grows Succulents. We’ve only just discovered him, but he’s been growing and selling them for almost 20 years. He likes to grow them in little pots so everyone can afford them. They start at just $3.99. “They’re not gold” he tells me. “I use secret fertiliser to make them grow” he tells me. What is it, I ask him? Do you have a special selection of Succulents, back at the nursery, that you wouldn’t sell, no matter how much I offered you? He makes me nearly fall off my chair, I’d invited him in for coffee. He wasn’t real impressed when I told him I’ve only got instant. He’s already been telling me how to run my business. I don’t mind. He’s got so many ideas, he’s gotta be on something, he’s just so enthusiastic. So where in Greece did you come from? You know what? He tells me. “Succulents love lots of water at this time of year. When I take them to nurseries that have over head watering systems I can’t believe how much they’ve grown when I go back the next week, I don’t water mine enough”. He’s still talking when we start to lock up the doors to go home. He’s in no hurry. Peter works 7 days a week. Growing Succulents is his life. If you love Succulents come and see our amazing display. I was driving through Camden during the week and I noticed this amazing Garden. It was so simple but so classy. It had Lavender Avonview planted as a hedge with White Iceberg Standard Roses. Behind that they had a hedge of Viburnum ordatissimum. The white roses will be flowering next week and this garden is going to pop, pop, pop! We’ve got all these plants in the nursery if you want to be a copy cat. The best gardening ideas are stolen. I’ve spoken before about the secret to keeping Lavenders looking great. You have to prune them twice a year. Cut back by 25% after the big flowering flush in spring then again in autumn. The most popular red rose today is still Mr Lincoln. Amazing. This rose was first released in 1964. It has the most spectacular large red flowers that have the most fragrant flowers ever! 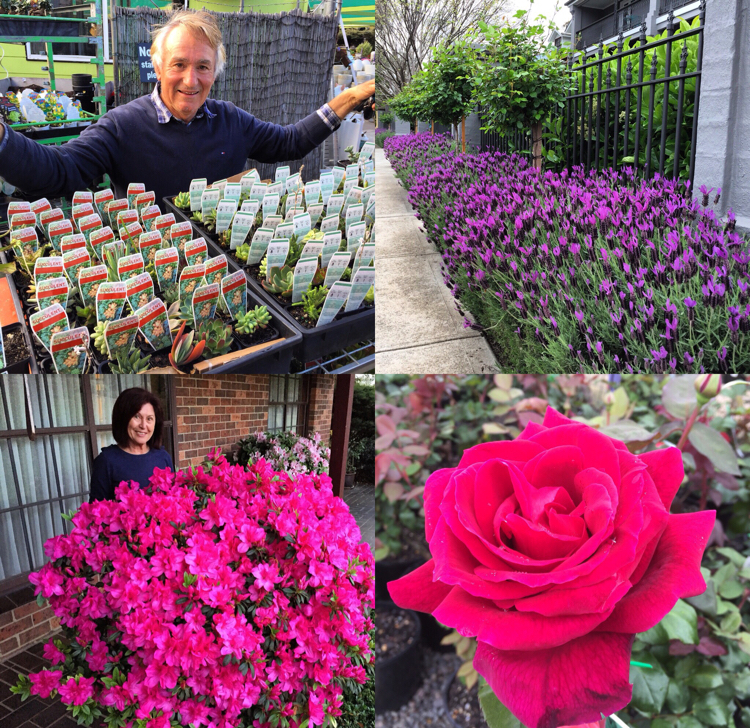 We buy 100 plants every winter and we sell out in spring when they burst into bloom. We only have 15 left so if you want the best Rose ever for your Garden you better zoom zoom in to see us. Carmen Vella is the Azalea Lady. She grows them in big pots all around her house. I stopped by, to find out her secrets. She used to hand water them, but then her husband Charlie, hooked up a drip irrigation system that they turn on every second day. This has made life so much easier, because although they are both retired, they help out with the grandkids every day. Carmen has always loved Azaleas. She used to visit Cowell’s Azalea and Camellia nursery when it was open at Theresa Park. She even remembered the owners names, Charlie and Helen. She has a few Camellias too but Azaleas are her passion. She feeds them twice a year with Dynamic Lifter in October and February. This surprised me because I would recommend “Organic Life”. She also uses an Azalea food that’s safe for potted plants. After they finish flowering she cuts them back by up to 25%. This keeps them bushy and makes them flower again like this beauty. To control Lace Bug she uses Confidor. Many of our gardeners have had success with the tablets. This year Carmen lost lots of plants that have been hit by frost. Not Azaleas, they survived, but she lost a Stephanotis that’s she’s had for 20 years. Carmen and Charlie said that this was the worst frosts in Camden for 38 years. So that’s why you’ve lost plants in your garden too. Carmen also sprays for Petal Blight, but this season was so dry it didn’t effected her plants. Times have changed this week. Her favourite Azalea is out the back of the house. It’s a white flowering variety called “White Bouquet”. It flowers twice a year, in spring and autumn. Carmen and Charlie have just got back from a holiday in Canada where they saw Bucharest Gardens. “You have to see it?” they both spoke together. Gardening conditions have never been better than this. If you’ve been dreaming about making a garden or planting a fruit tree. Do it today. It’s going to thrive with this much rain around.